Photo caption: A mix of open spaces and greenery makes for a relaxing atmosphere. 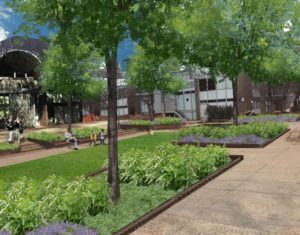 River Park, an 11-acre cooperative in Southwest DC designed by mid-century modernist architect Charles M. Goodman and landscape architect Eric Paepcke, recently began a campus-wide rehabilitation of its grounds. The work at the property, located at 4th St. SW and Delaware Ave. SW, is part of a wider capital improvement plan intended to upgrade infrastructure, improve service reliability and increase member satisfaction. The capital improvement projects are being funded, in part, by an $8.6 million loan from National Cooperative Bank. As part of the capital improvement plan, River Park recently completed the replacement of an underground closed-loop system that provides the townhouses in the complex with heating and cooling. The pipe replacement project required extensive trenching and utility work that left the campus with a patchwork of temporary walkways and distressed greenery. To address ongoing and anticipated issues involving the landscape, River Park engaged Lea|Siri Landscape Architects in summer 2015 to develop a master landscape plan that could be implemented once the underground piping project was completed. Lea|Siri, led by co-principals Marsha Lea and Lisa Siri, along with structural engineers Ted Ross Engineering and River Park General Manager Anthony Flournoy, helped guide the co-op through more than two years of planning, membership engagement, presentations, and approvals. Based on a newsletter sent to residents, the final master landscape plan, approved by the co-op’s board of directors in September 2017, includes: replacing existing lighting and adding new fixtures throughout the property, replacing all electrical conduit and wiring, improving tree wells and planting boxes, reducing concrete coverage and replacing paths and walkways where necessary, drainage and irrigation improvements, new plantings, recreational space enhancements, and parking lot alterations. The general contractor overseeing the work is Trinity Group Construction. Wherever possible, existing trees, bushes, and plantings will be maintained. Plantings that have been deemed unhealthy by arborists at Casey Trees and others that impede proper sloping or drainage will be removed. Casey Trees also planted 18 trees on the property that will be joined by an additional 27 shade trees and 13 flowering trees to be planted by River Park. The landscape enhancements seek to return the community to a more park-like setting and respond to concerns about the amount of concrete at the complex, which is directly related to one of River Park’s larger operating costs—the DC Department of Energy & Environment’s Stormwater Fee and DC Water’s Impervious Area Charge. The original landscape, with a high proportion of the campus covered by concrete, incurs significant water surcharges. Renderings of the original landscape produced by Helmut Jacoby during the design development phase in 1960, prior to construction, show more vegetation on the grounds than was ultimately planted. The new Lea|Siri campus design, which has similarities to the initial Jacoby rendering, replaces concrete with green space wherever practical and will reduce the amount of impervious surfaces by more than 50,000 square feet. This reduction, achieved by identifying walks that require a width that allows for the occasional service vehicle while reducing the width of other footpaths to a comfortable dimension, will result in less storm water run-off, a cooler outdoor environment, additional space for plantings, and improved health for many of the existing trees. 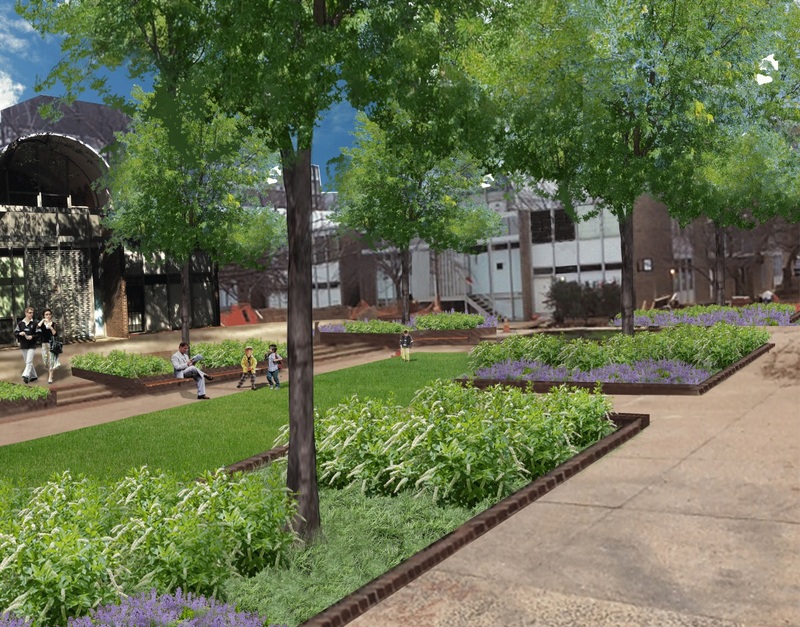 Two bio-retention areas will also be added on the eastern portion of the campus to help alleviate run-off. Demolition for the project started in January. 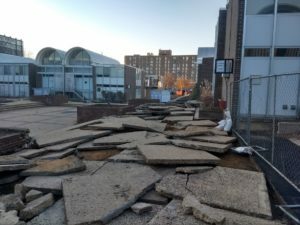 Once demolition is finished, below-grade infrastructure will be installed, including irrigation, drainage, and electrical lines, followed by hardscape installation, and concluding with planting. The total project duration is anticipated to be 10 months, barring delays due to weather or other issues. Once completed, River Park’s landscape will feature an expanded playground and lawn; a larger community picnic area with tables, grills, and shade trees; a renovated courtyard with universal accessibility and enlarged planters; additional seating in key areas of the campus for greater use of the outdoor spaces; new shade and flowering trees in uniform groupings to support the original design intent and to provide more seasonal interest; and a more welcoming and unified feel throughout the community.